rederick Frahm was born November 8, 1964, in Hemet, California. 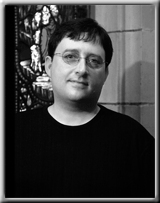 His compositional output includes art songs, song cycles, and works for organ and for choir. He has composed three cantatas: From East to West, War Cantata and Grant Us Untroubled Rest. A prize-winning and critically-acclaimed composer, his pieces have enjoyed frequent performances in the U.S., Europe and South Africa. The composer's complete works and correspondence are archived in the Mortvedt Library at Pacific Lutheran University in Tacoma, Washington. Mr. Frahm is currently Director of Music at St. Luke's Lutheran Church in Albuquerque, NM. Previously he served as Director of Music at Saint Paul's Episcopal Church in Bellingham, Washington. In addition to his work as a parish musician and a private studio teacher, he has contributed to the Bellingham Herald as a classical music critic. He has also served as an adjunct faculty member of Concordia University (River Forest, IL) where he taught modal counterpoint, music theory and composition, and orchestration. In addition to his duties as music director and as a private studio teacher, he has contributed regularly to the Bellingham Herald as a classical music critic. Mr. Frahm has also served as an adjunct faculty member at Concordia University (River Forest IL) where he taught modal counterpoint, music theory and composition, and orchestration. He is a graduate (BM in Church Music, MM in Organ Performance) of Pacific Lutheran University, where he studies organ and counterpoint with David Dahl, Gregory Peterson and Randall McCarty. He studies composition with Gregory Youtz (PLU), Gary Smart (University of Wyoming), Wlater Pelz (Concordia University, Reiver Forest) and Roger Briggs (Western Washington University). In addition to CNP, Mr. Frahm is published by Augsburg Publishing House, Concordia Publishing House, live Oak House, Wayne Leupold Editions, Zimbel Press, Capstone Records and Wergo Schalplatten.